Cell, 2015, 160(1-2): 161-76 . Ipatasertib (GDC-0068) purchased from Selleck. 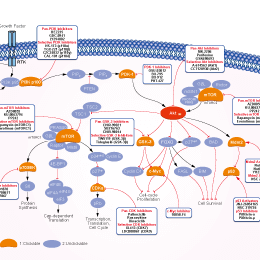 The functional significance of the PI3K/Akt pathway in CCR5-mediated DNA damage signaling was assessed using the ATP-competitive, small-molecule pan-Akt inhibitor (ipatasertib) and or the CCR5 inhibitor Maraviroc in doxorubicin-treated cells. Western blot analysis was conducted as shown for SUM-159 cells (B) and MDA-MB-175VII (doxorubicin-resistant breast cancer cells) (D). Clin Cancer Res, 2018, 78(7):1657-1671. Ipatasertib (GDC-0068) purchased from Selleck. In vitro evaluation of BAR activity in A549-BAR cell line. (A) Bioluminescence activity was quantified 1 hour after treatment in response to various compounds at two concentrations (n = 6). (B) Western blotting analysis after 1 hour of treatment showing the expression of pAKT (Ser473), AKT, pPRAS40 (Thr246), RAS40, pGSK3β (Ser9), GSK3β, pEGFR (Tyr1068), EGFR, and β-Actin of whole cell lysates. Neoplasia, 2017, 19(4):310-320. Ipatasertib (GDC-0068) purchased from Selleck. Lin K. Cancer Res, 2011, 71(8 Supplement), abstract DDT02-01. Tabernero J, et al. Ann Oncol, 2011, 22(suppl 3), abstract IL33. Heidi M. Savage, et al. Cancer Res, 2012, 72(8 Supplement), 966. Roel Funke, et al. American Society of Clinical Oncology (ASCO) Annual Meeting, 1-5, 2012. CCT128930 : Akt2-selective, IC50=6 nM. AZD5363 : Akt1, IC50=3 nM; Akt2, IC50=8 nM; Akt3, IC50=8 nM. Perifosine (KRX-0401) : Phase III for relapsed and refractory multiple myeloma. AZD5363 : Potent inhibitor of all isoforms of Akt (Akt1/Akt2/Akt3) with IC50 of 3 nM/8 nM/8 nM, similar to P70S6K/PKA and lower activity towards ROCK1/2.